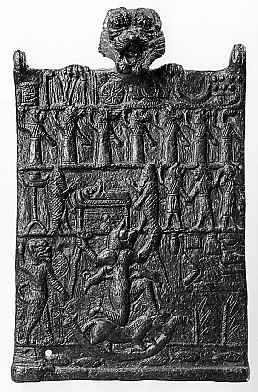 Etiquetas: amuleto mesopotamico, anciente demons, babylonias assyrian demonology, demonia, demonia Lamashtu, demonio pazuzu, demonios, dioses, esposa de Pazuzu, exorcismo, Lamasthu demonia mesopotámica, monstruos, Pazuzu. Este casi desconocido demonio de la mitología babilónica se representaba como un ser antropomorfo, alado, con pies en forma de garras de ave y cabeza de león. 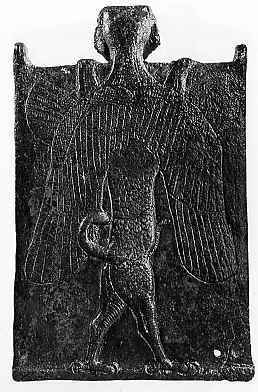 The demon first appeared in early Babylonian myth in the guise of the “storm-bird” Zu, who stole the Tablets of Destiny from the dragoness Tiamat. In the later Babylonian civilization, he once again appeared, this time under the name of Pazuzu, and was said to be the child of the chief wind-demon, Hanpa. When Pazuzu is summoned by worshippers, he appears in a statuesque form, frozen into the position described above. After 1D4 rounds, however, he metamorphoses out of the statue form to his living form. In this form, he is fully capable of movement. 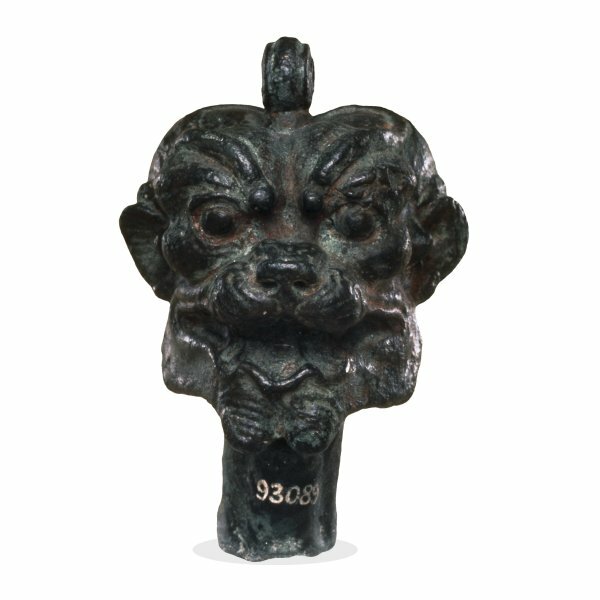 Several metal amulets depicting Pazuzu have been found. In all of these amulets, he is represented as appearing similar to the above description. Of these small (a few inches in height) amulets, an occasional magical one is found. The attached photograph depicts a non-magical amulet found in Iraq. The demon is aware whenever one of these amulets is handled. When this happens, an effective Mind Exchange spell is cast–usually it is the discoverer who is possessed, although not always. In cases of possession, Pazuzu’s victims use the demon’s STR, CON, INT, and POW. Pazuzu’s worship has died off, for the most part, although isolated groups of worshippers can still be found in the Middle East, particularly among the violently anti-Israeli Sons of al-Azrad, reputedly sponsored by the Karotechia. Worship remains strong among ghouls, particularly those of European and Asian areas surrounding the Middle East. Some more enlightened New World ghouls worship Pazuzu, although most do not. The Utukku, a race serving Pazuzu, are believed to be relatives or possibly a subspecies of ghoul. Weapons: Claw 65%, damage 1D10+3D6. Armor: 12-point rocky shell (2). Spells: Implant Fear, Shrivelling, Summon/Bind Ghoul, Summon/Bind Utukku, Wither Limb, Wrack. (1)In living form, Pazuzu has a move rate of 8/12 fly. (2)In living form, Pazuzu sheds his rocky shell (causing 1D6 damage within a 2 yard radius) and has 6 points of leathery hide. Effectively identical to ghouls (see COC5.5), except with a move rate of 6/20 fly. A ruined city in what is now Kuwait, El Qishara was the center of Pazuzu’s cult in ages past, when he had organized worshippers. That time has long since passed, and now the city of El Qishara is nearly consumed by the sands. Images of Pazuzu, identical to those found in the metal amulets but carved of weathered sandstone, glower menacingly over the entire city. The city is still favored by Pazuzu, however. El Qishara remains the only place on earth where unsummoned, naturally-occurring Utukku can be found. In addition, if someone tries to summon Pazuzu in these ruins, he or she gains a +45% bonus. Summon/Bind Utukku spells are automatically successful at El Qishara. Summon/Bind Utukku Call/Dismiss Pazuzu: This spell functions identically to the Call/Dismiss spells outlined in CoC5. It must be cast, however, in a desert or otherwise arid region. If the caster is in close proximity to an image of Pazuzu, the spell’s chance of success increases by +20%; if an enchanted amulet, +25%. Enchant Pazuzu Amulet: Used to make an enchanted amulet for either summoning of the Utukku or Pazuzu himself, as well as possession attacks. Requires the sacrifice of an animal of at least SIZ 6, with whose blood an image of Pazuzu must be anointed. The caster loses 1D4 temporary magic points, 2 POW, and 7 Sanity. Summon/Bind Utukku: This spell functions as does a normal Summon/Bind spell. Like Call/Dismiss Pazuzu, an image of Pazuzu increases the chance of success by +20%. The Mesopotamian scribes compiled long lists of their gods. There were hundreds of gods who were responsible for every thing in the world, from rivers and mountains to making bread or pottery. The gods were known by different names depending on whether the scribes wrote Sumerian or Akkadian. The following list of the most important gods, goddesses, demons and monsters uses their Akkadian names with their Sumerian names in brackets. Thou N son of N [ie himself],thy mother has warned thee, and said, Guard thyself from Shabriri, Briri, Riri, Iri, Ri. I am thirsty in a white cup. It was believed that as the person recited the syllables of the demon’s name, the demon also faded away - demonstrating how powerful words can be. Labartu, Lamashtu (Lamaštu), en acadio o Dimme en sumerio, era unndemonio femenino que causaba fiebres, especialmente en los niños. En el registro superior, sacerdotes-médicos vestidos de pez realizan un exorcismo; en el registro inferior, la Labartu está representada sobre una barca. Lamasjtoe. Lamashtu. 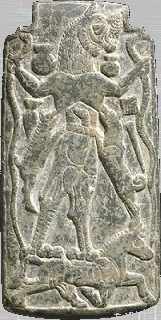 Mesopotamische godin. Haar Soemerische naam is Dimme. Vaak wordt naar haar verwezen als demoon, maar uit de spelling van haar naam in spijkerschrift wordt afgeleid dat ze in Babylon en Assyrië als een godin werd vereerd. Lamashtu was de dochter van de hemelgod Anu (de Soemerische An). Ze doodt moeders in het kraambed, veroorzaakte misgeboortes en bedreigde het leven van kinderen met ziektes. Ze dronk het bloed van mannen en verslond hun vlees. Ze verstoorde de slaap en veroorzaakte nachtmerries. Ze werd vaak omschreven als ‘zeven heksen’. Ze wordt vaak afgebeeld met ontblote borsten, waaraan een hond en een varken worden gezoogd. Ook kwam ze op amuletten voor als vrouw met het hoofd van een leeuw of vogel, die knielde op een ezel. In beschrijvingen komt ze voor met het een leeuwenhoofd, ezeltanden, naakte borsten en een harig lichaam, vlekkerige handen, lange vingers en nagels, en met vogelklauwen. Haar heilige dier is een ezel, waarop ze op afbeeldingen staat. Ze draagt twee slangen in haar handen. Lamashtu is verwant aan Laima en Medusa uit de Griekse mythologie, en aan de Hebreeuwse Lilith. Clytaemnestra werd geplaagd door een nachtmerrie die met wezens als Lamashtu of Lamia kan worden geassocieerd. Historia de las Religiones Antiguas. Tomo I. (Próximo Oriente). Editorial Sanz y Torres, Madrid, Febrero 2006.